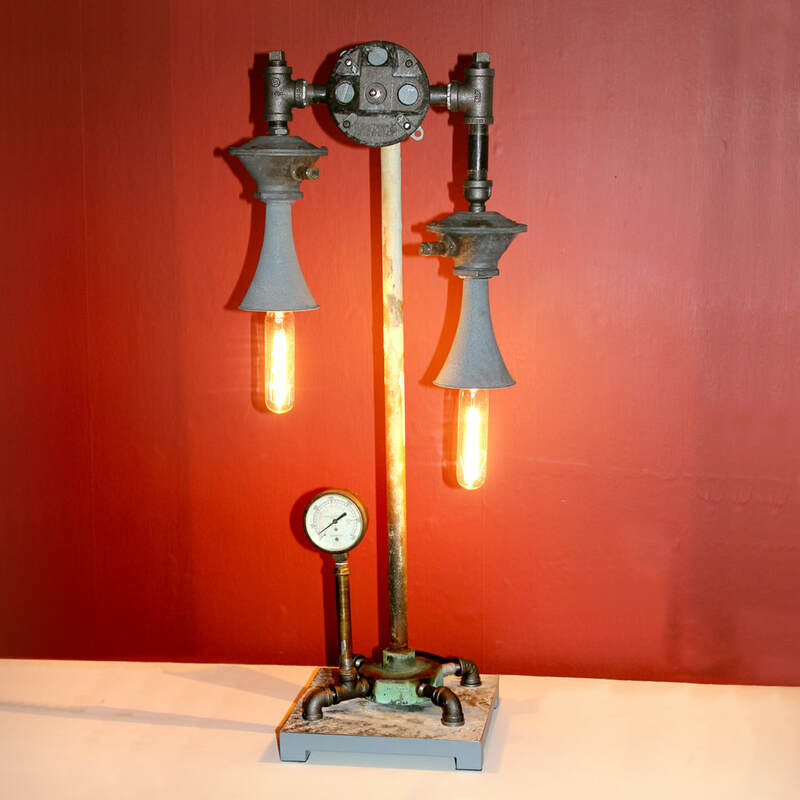 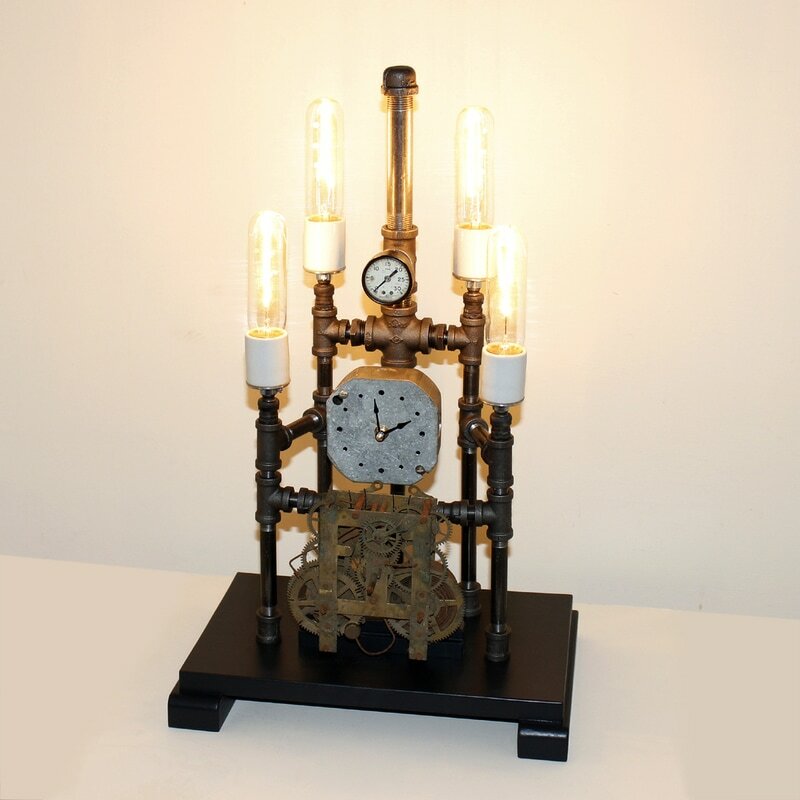 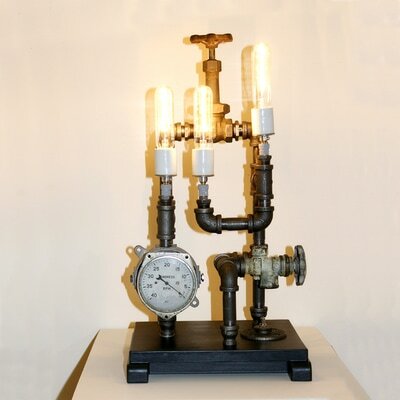 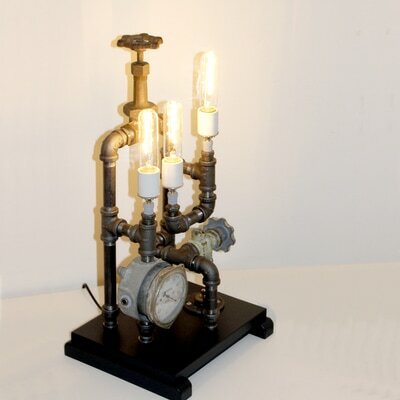 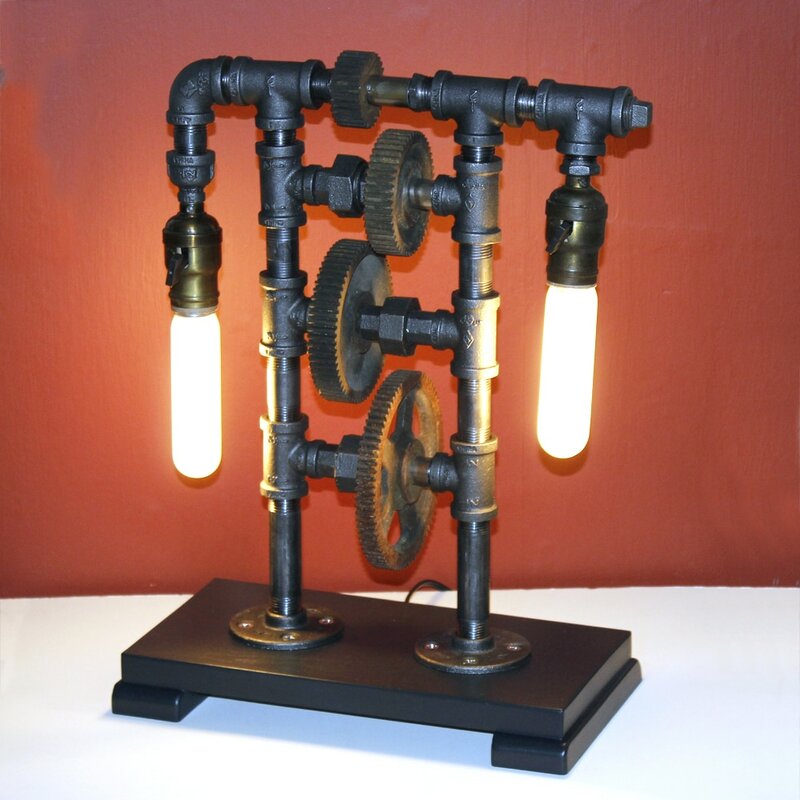 Steampunk lamps are assembled from steam and machine age components, including pipes, gauges, gears, valves, bulb cages, sockets and other industrial hardware. Steampunk is a sub genre of science fiction and sometimes fantasy that incorporates technology and aesthetic designs inspired by 19th-century industrial steam-powered machinery. Steampunk works are often set in an alternative history of the 19th century's British Victorian era or American "Wild West", in a post-apocalyptic future during which steam power has maintained usage, or in a fantasy world that similarly employs steam power. 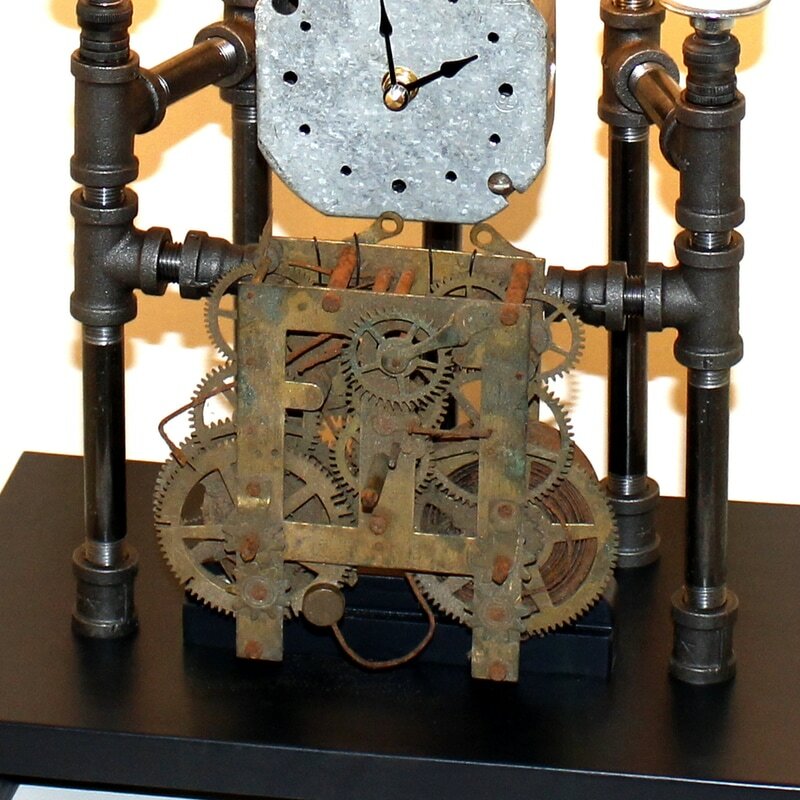 Steampunk perhaps most recognizably features anachronistic technologies or retro-futuristic inventions as people in the 19th century might have envisioned them, and may include fictional machines like those found in the works of H. G. Wells and Jules Verne. 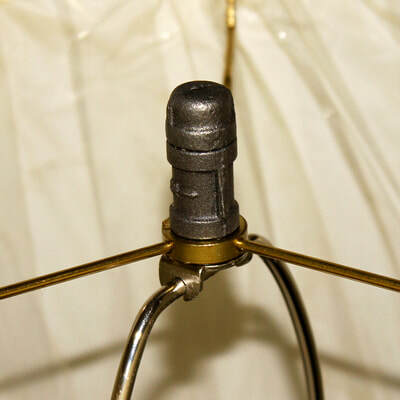 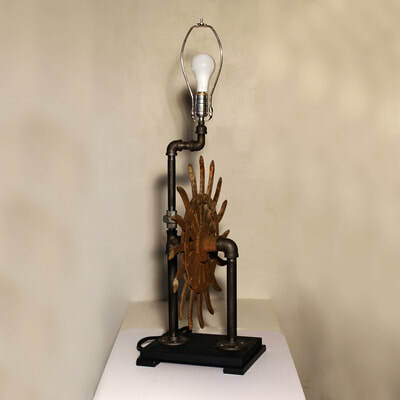 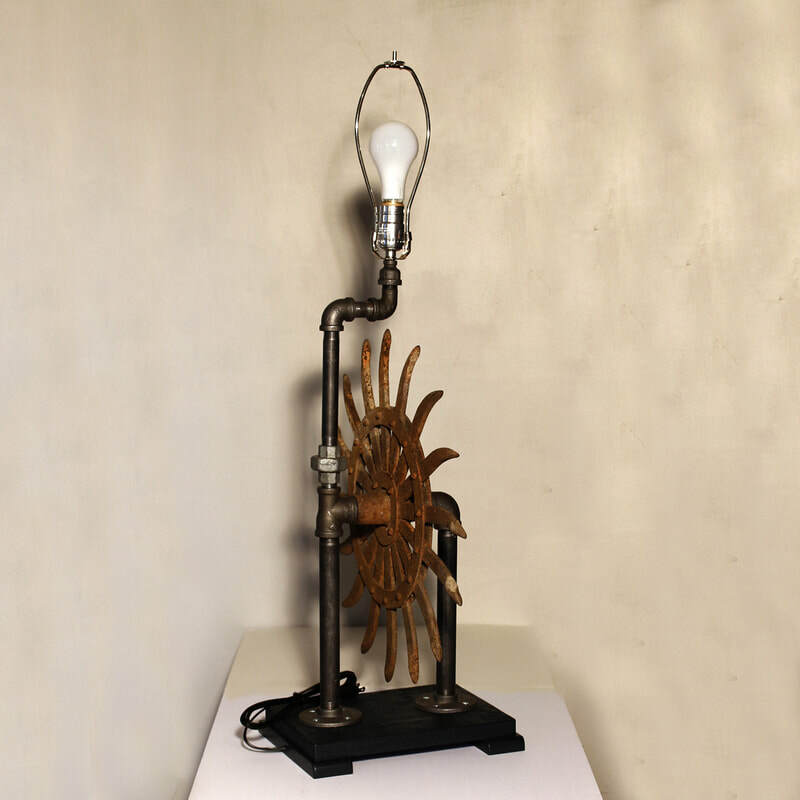 These authentic steampunk lamps feature recycled vintage parts, and should not be confused with the growing popularity of mass produced steampunk lamps made with factory reproductions of steampunk-like parts. 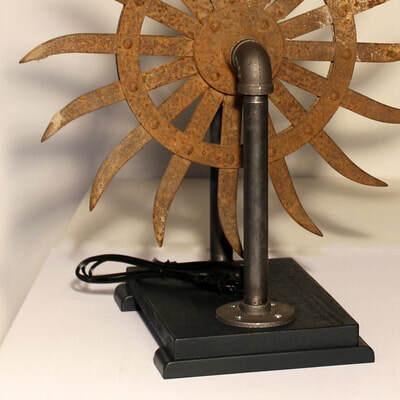 A heavily rusted cultivating wheel is a perfect found object for building an oversized recycled table lamp. 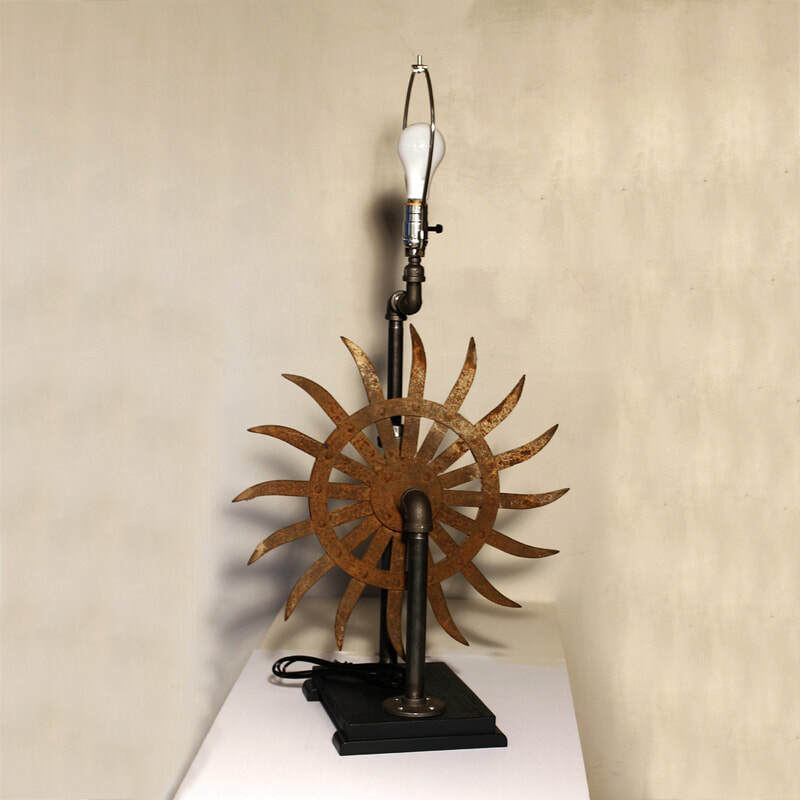 The shape and mass of the tined wheel yield a uniquely bold statement lamp. 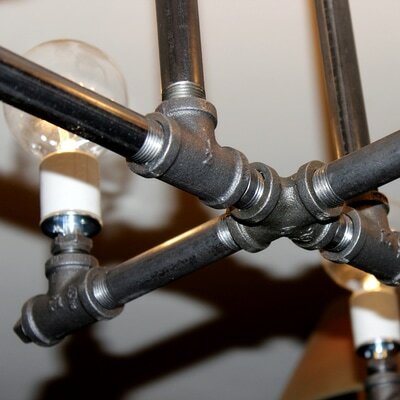 The result is a perfect merge of farm machinery with industrial pipes and fittings. 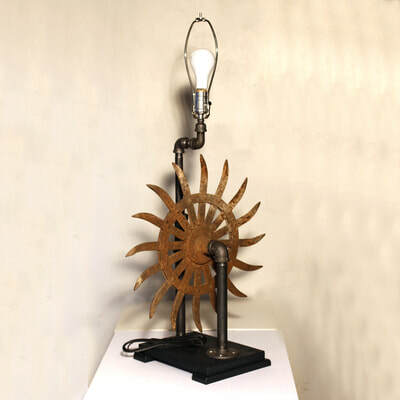 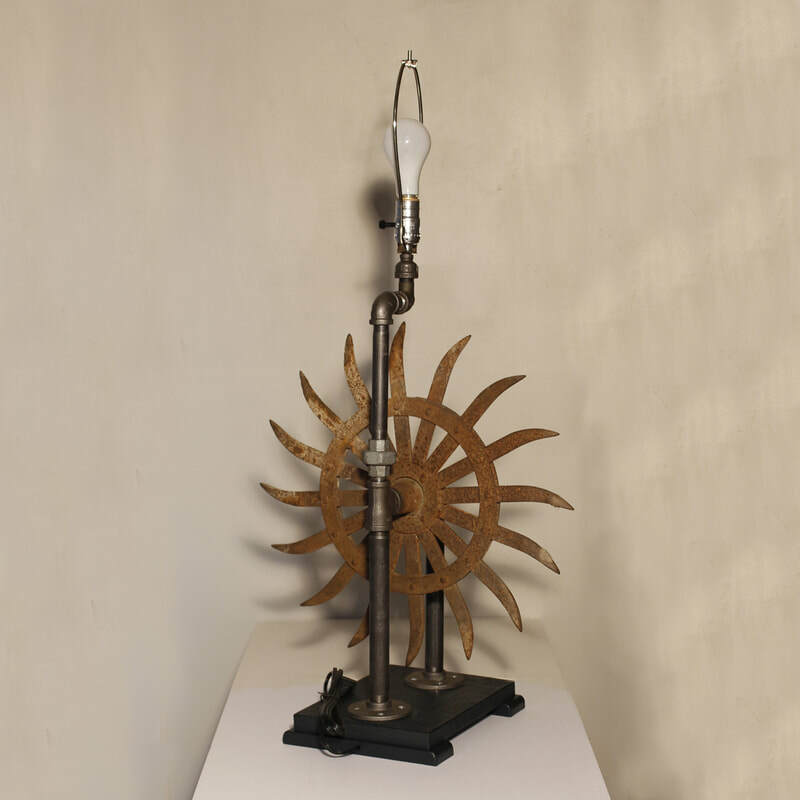 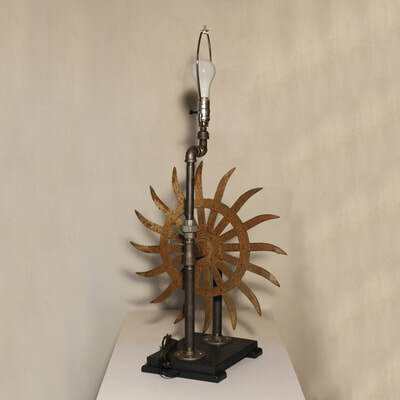 Originally part of a multi-wheel cultivating machine, but now a dramatic table lamp. 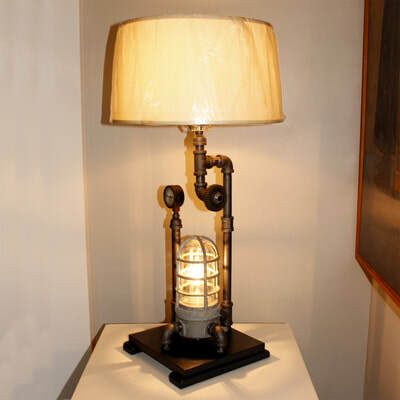 Lamp is mounted on a hand fabricated black wood base with sled rails. 19-inch wheel diameter and 39 inches tall with an 11-inch harp. 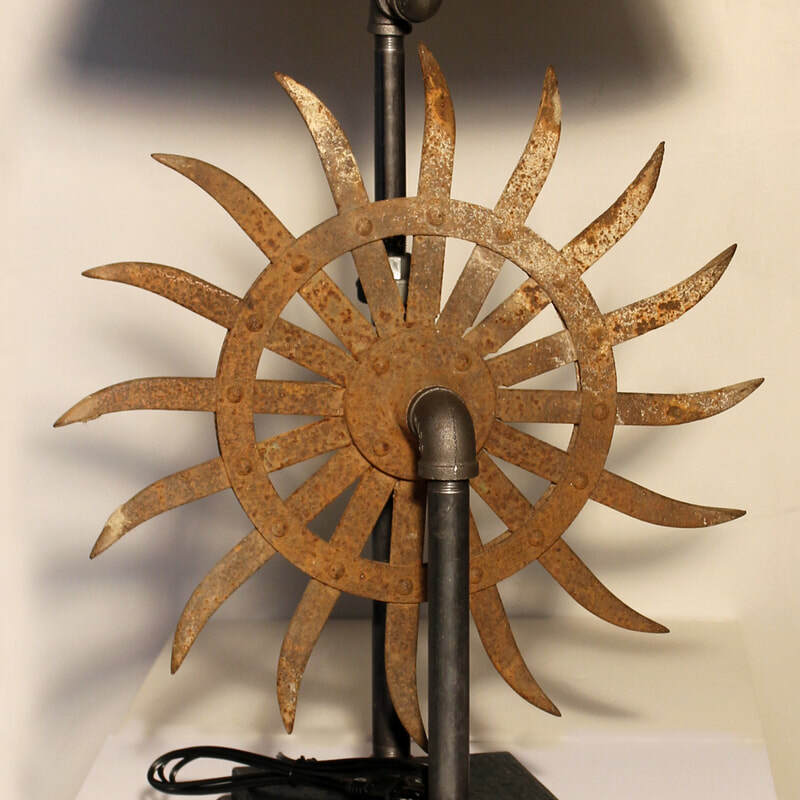 Comes with 11-inch harp and pipe fitting finial, but SHADE IS NOT INCLUDED. An 11-inch high, black or brown burlap large diameter shade is recommended, which should be wider than the shown 16-inch diameter shade. 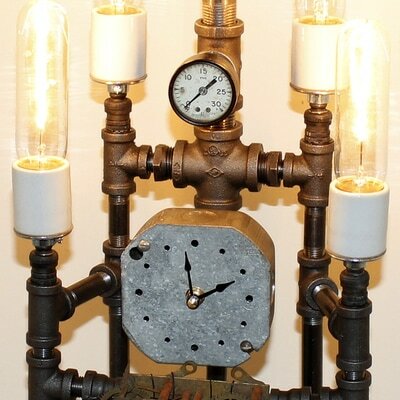 Here’s a totally unique steampunk pipe fittings lamp that showcases a recycled wind up clock movement accompanied by an operating battery powered quartz clock and inactive rpm meter.. A most utilitarian pipe fitting lamp with 3-way switch and four 25-watt tubular bulbs included. 13 x 9 inch black wood base; 21 inches high. 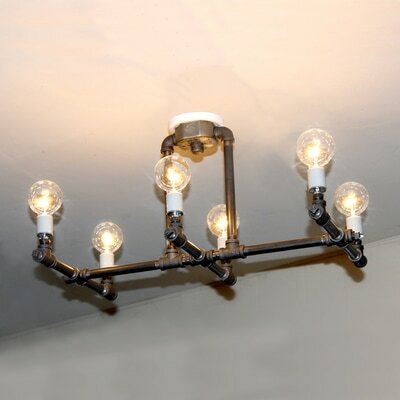 Pipe chandelier constructed from iron pipes, pipe fittings and porcelain sockets. 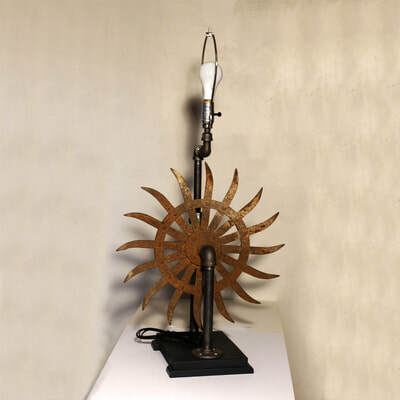 Provides high intensity light perfect for dining table, work table, kitchen island, game table or general ambient lighting. 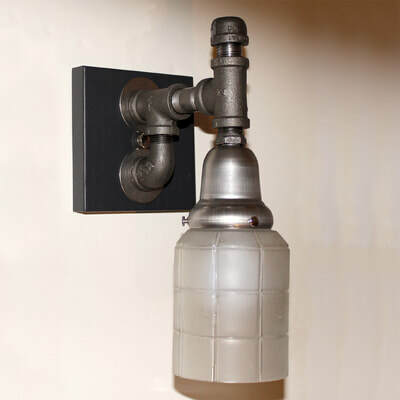 Comes with canopy, cross bar and ground wire for installation into electrical ceiling box. Add surface mount kit with a 15 foot cord, plug, cord switch and ceiling plate; NO WIRING REQUIRED. Globe bulbs included. 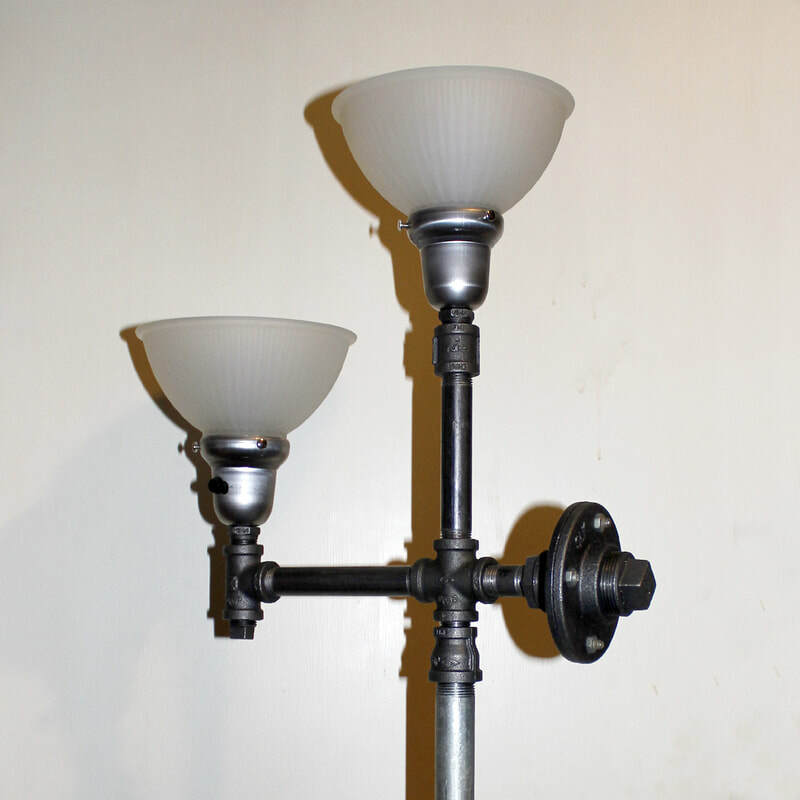 27-1/2 x 16 x 13-1/2 inches high. 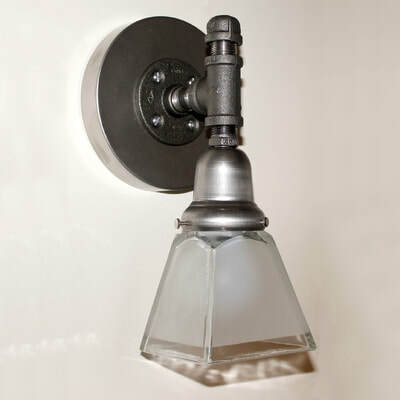 Electric box mount $175 + shipping. 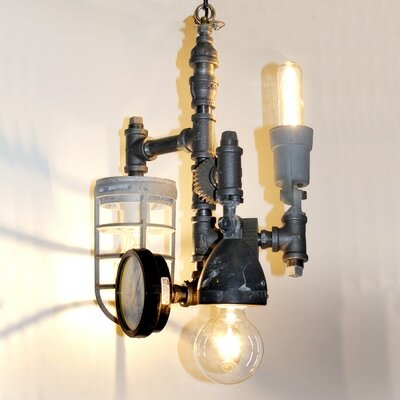 Another great steampunk ceiling light. 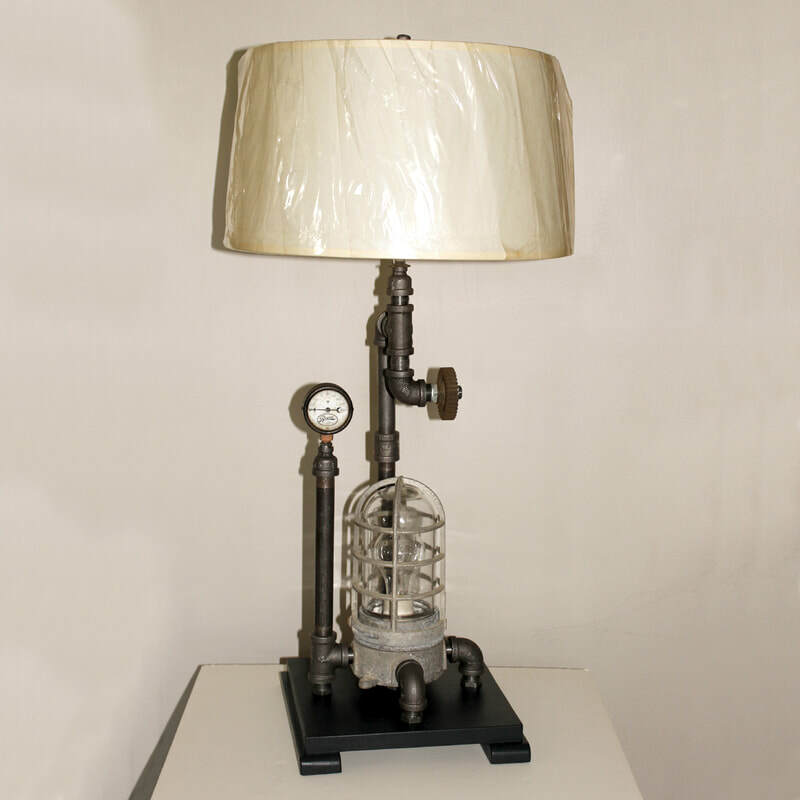 This one incorporates a massive 6000 pound/square inch pressure gauge from an industrial control system. 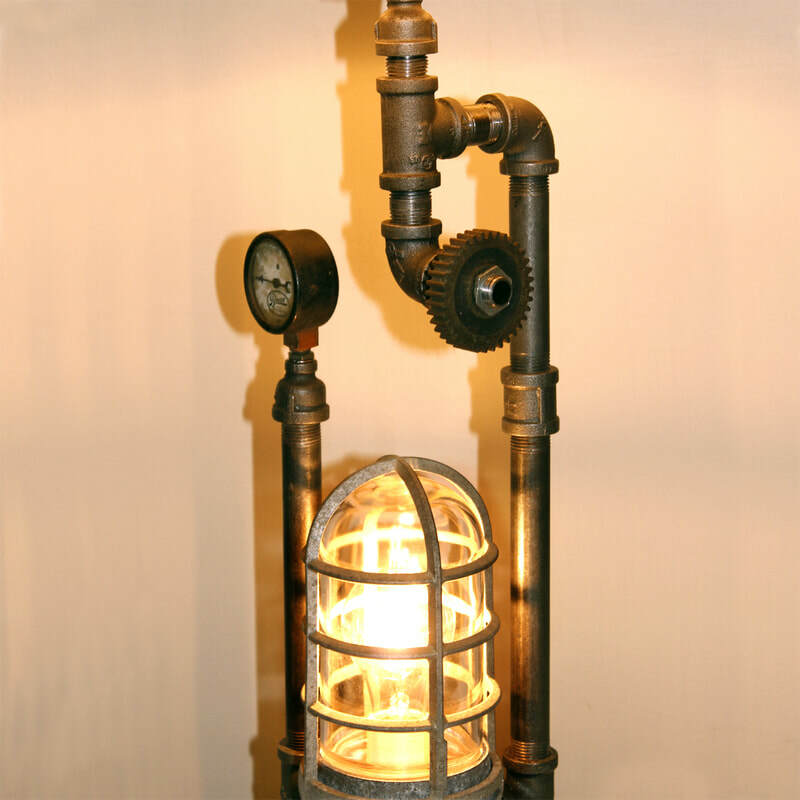 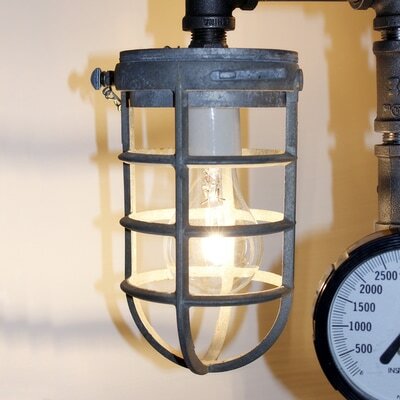 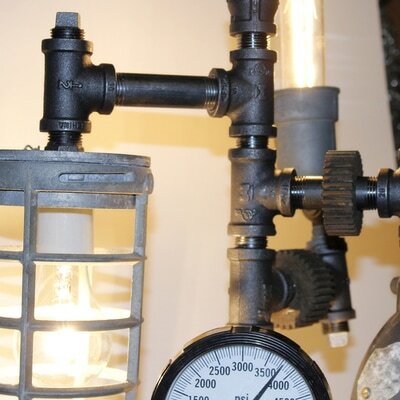 Complementing the gauge are two machine shop gears, a vintage industrial bulb cage and distressed floodlight holders. 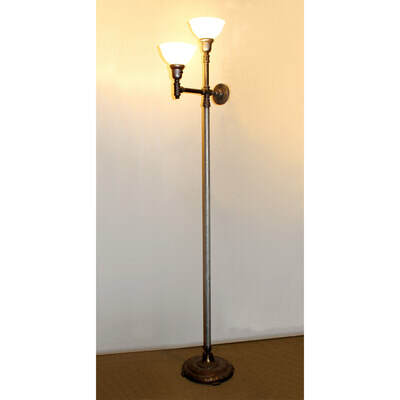 Height is 19 inches; width is 13 inches. 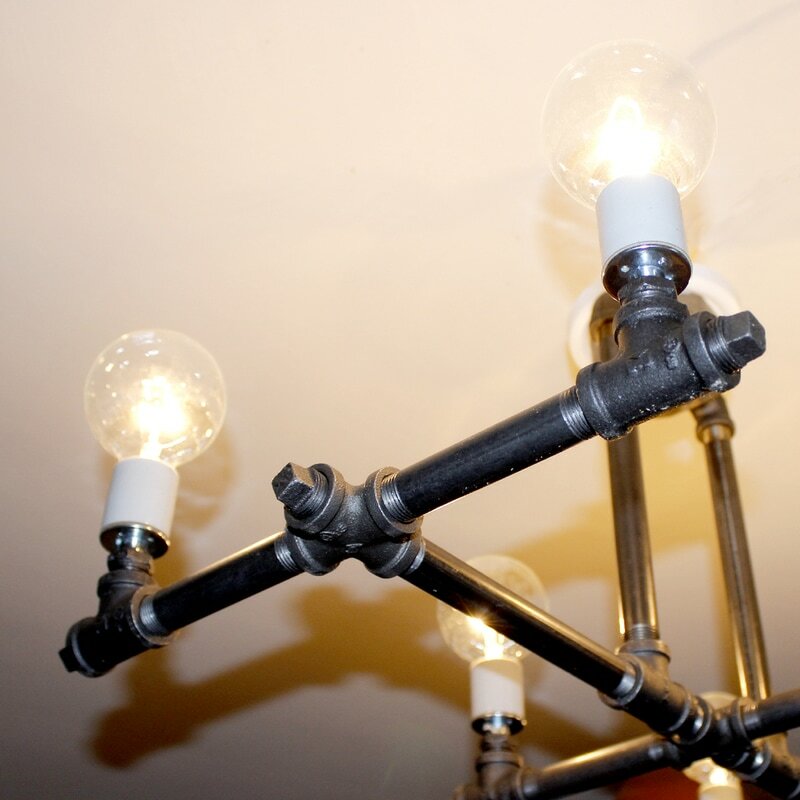 Antique filament bulbs could replace the clear bulbs but these nostalgic bulbs provide very little ambient light. This recycled pipe floor lamp boasts a decidedly industrial flare, while salvaging some heavy-duty landfill discards. The mega-heavy cast iron base came from a vintage Victorian floor lamp. 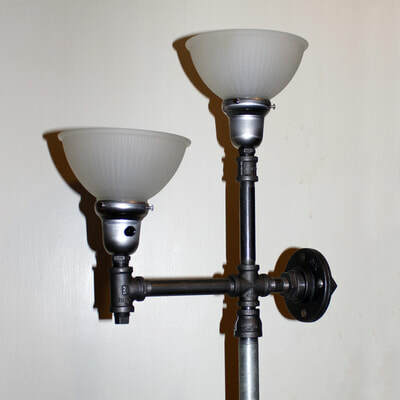 The reused glass shades eliminated another pound or so of landfill. 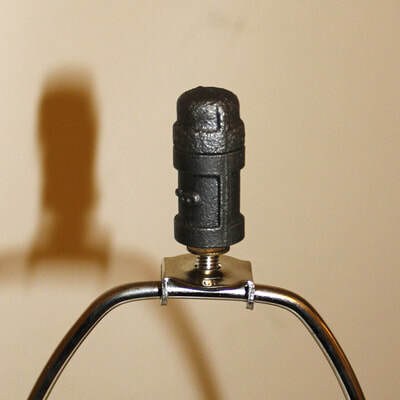 Sockets, cord and plug are new for safety and durability. The 3-way socket switch operates bulbs up to 150 watts: both off/lower bulb on/upper bulb on/both on. A 60 and 100-watt combo gives 3 brightnesses. 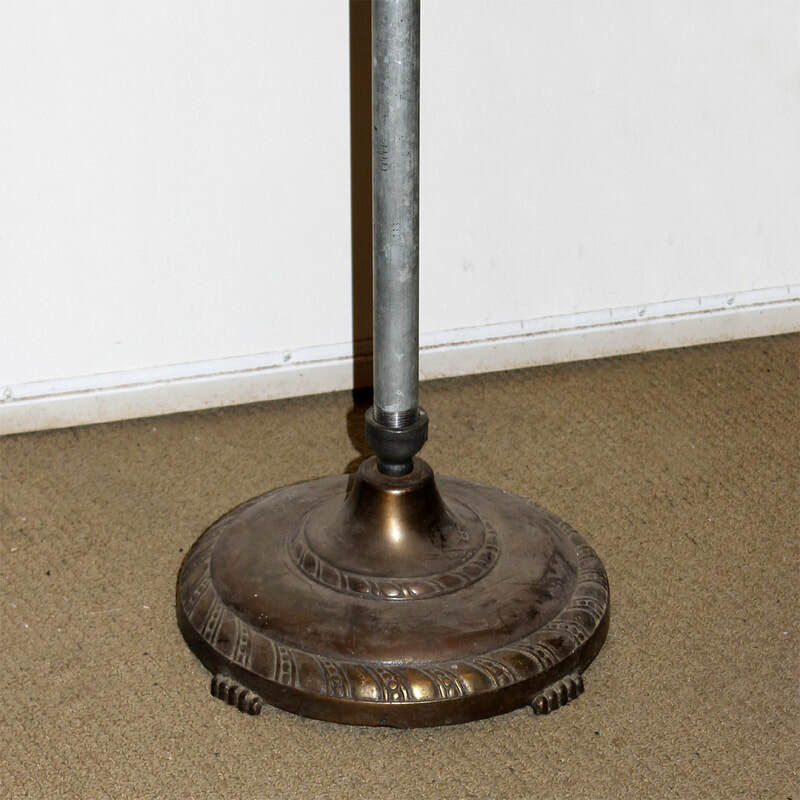 Height is 69 inches. 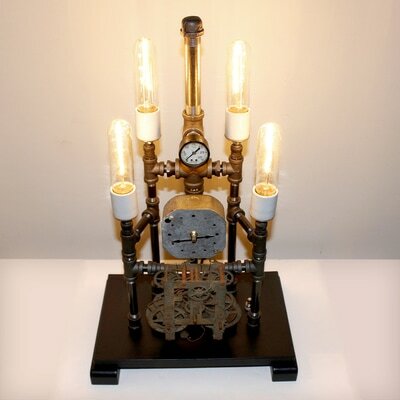 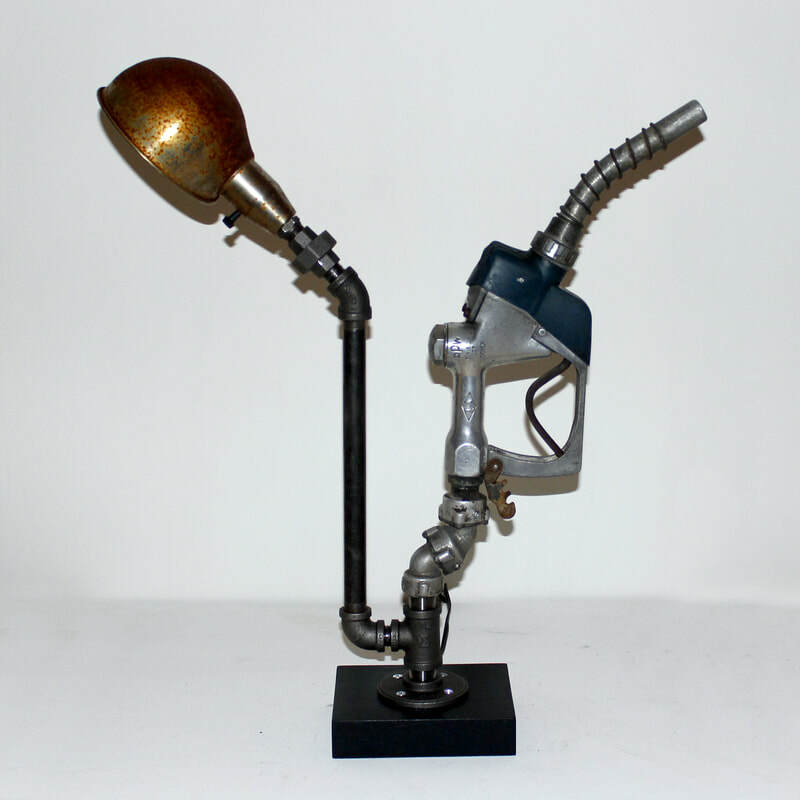 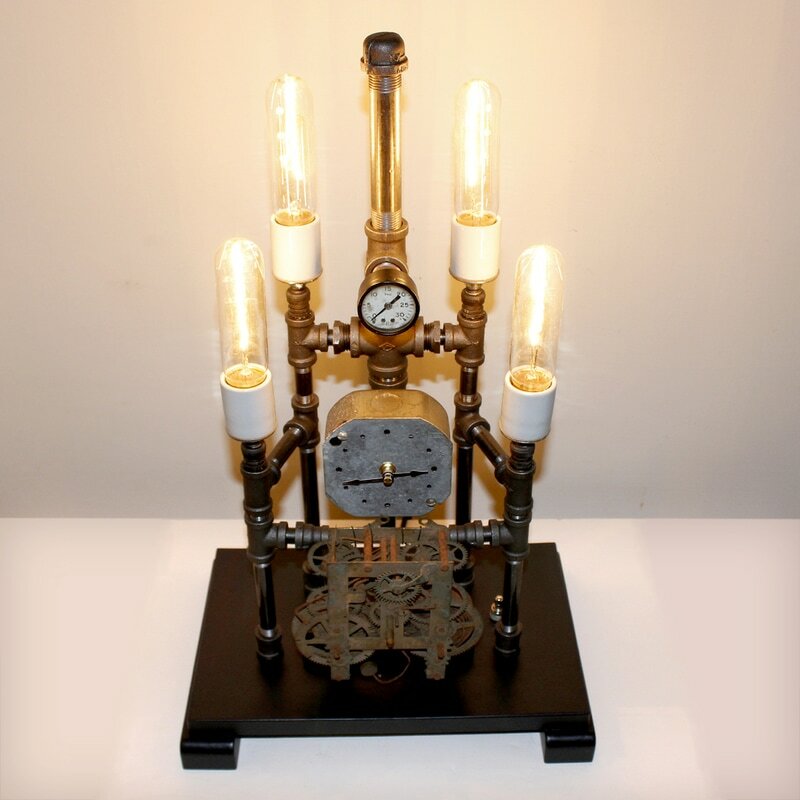 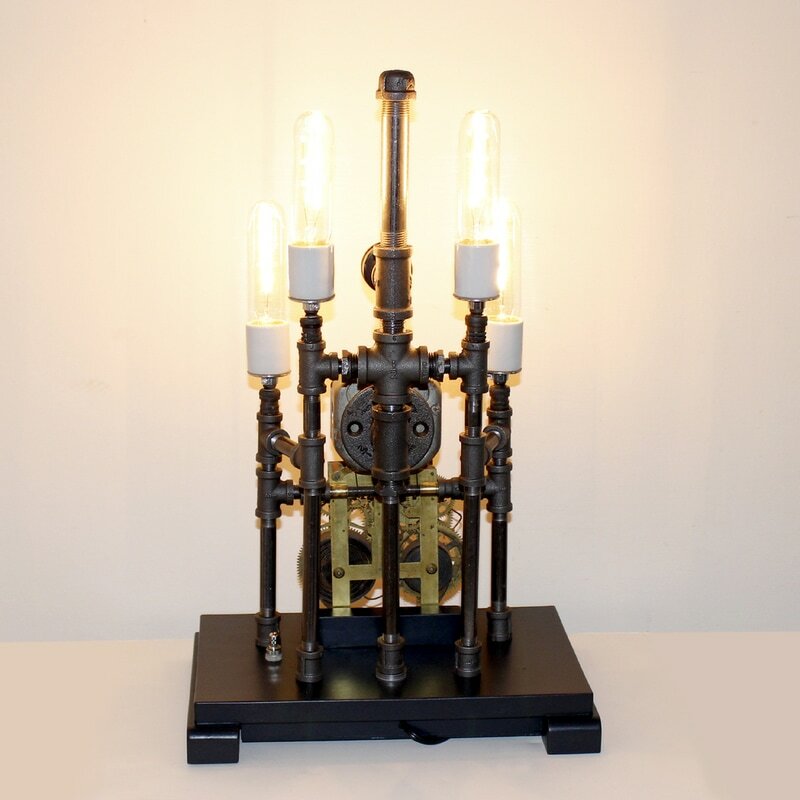 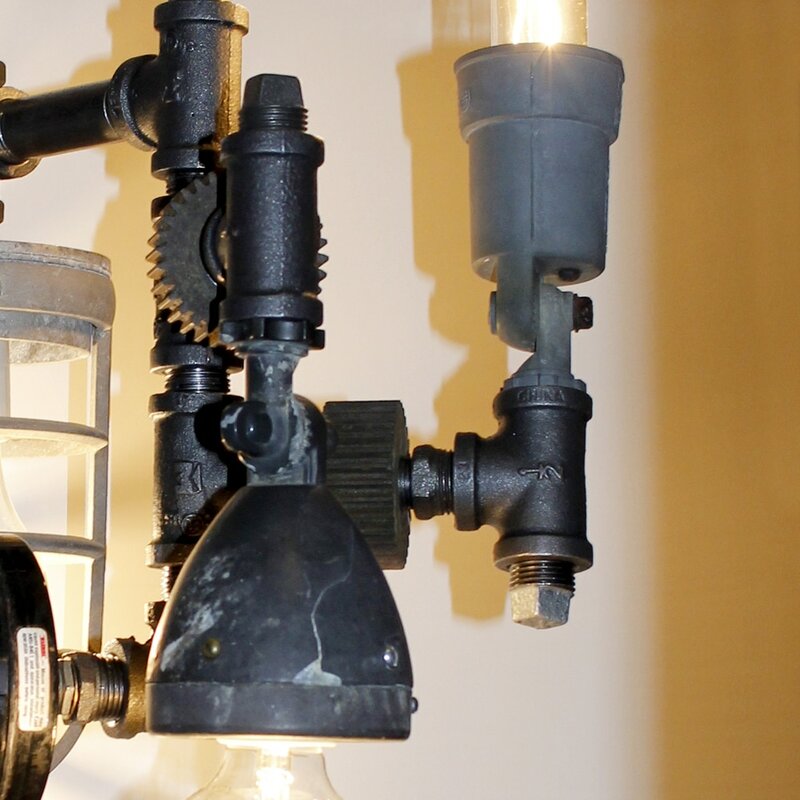 A striking steampunk table lamp from recycled machine shop gears and pipe fittings. The intricate assembly of Ts, elbows, unions, couplings, bushings, flanges and pipes support four recycled machine gears to yield an authentic industrial Iron Age look. Includes 40 wt frosted tubular medium base bulbs. For a vintage look, substitute antique filament tubular bulbs, but these provide very little ambient lighting. 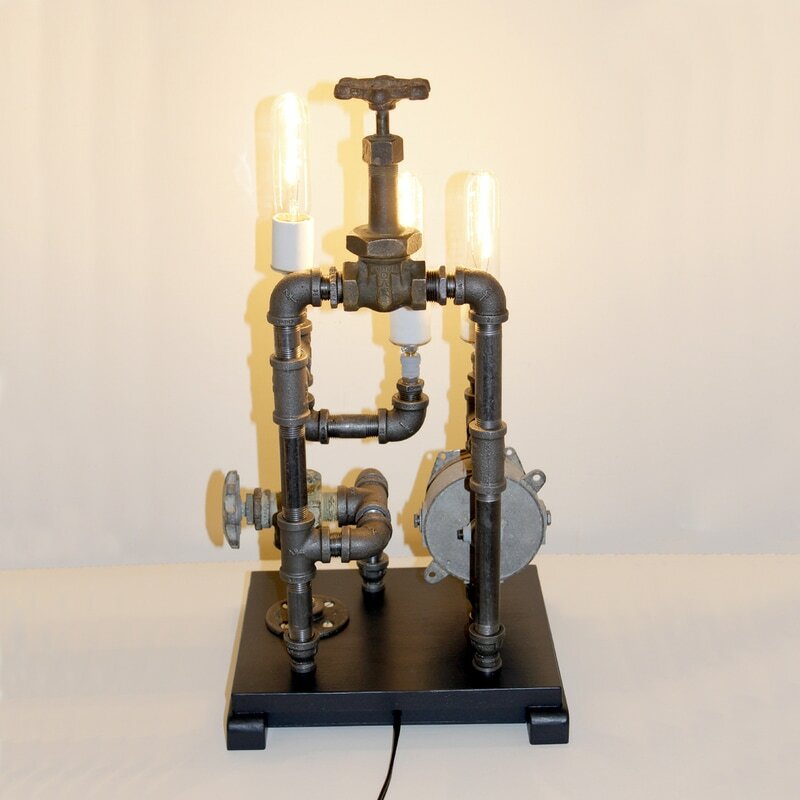 13" x 7" x 19" tall. Here’s a great table lamp for lovers of steampunk and pipe lamps, with a bit more elegance than the typical steampunk lamp. The recycled industrial bulb cage dominates the lamp design, which is accompanied by a repurposed gauge from a Pyrene Fire Extinguisher. Lots of pipe fittings, a vintage machine shop gear and a custom pipe finial all add to the industrial lamp character. 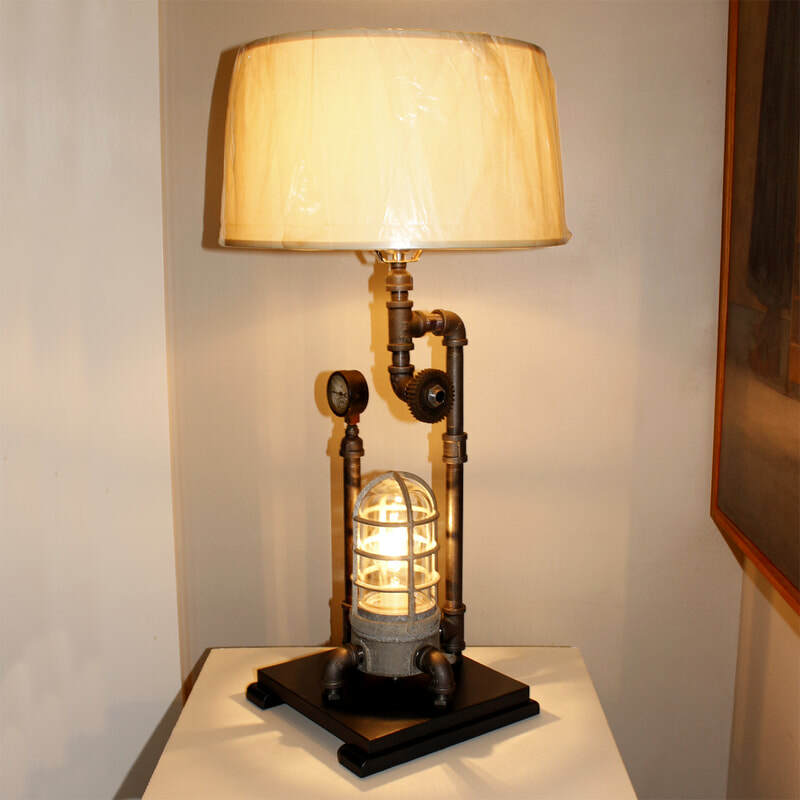 The lamp is mounted on a hand-fabricated black wood base. The 3-way upper turn knob socket offers a choice of lighting only the shade bulb, only the cage bulb or both. 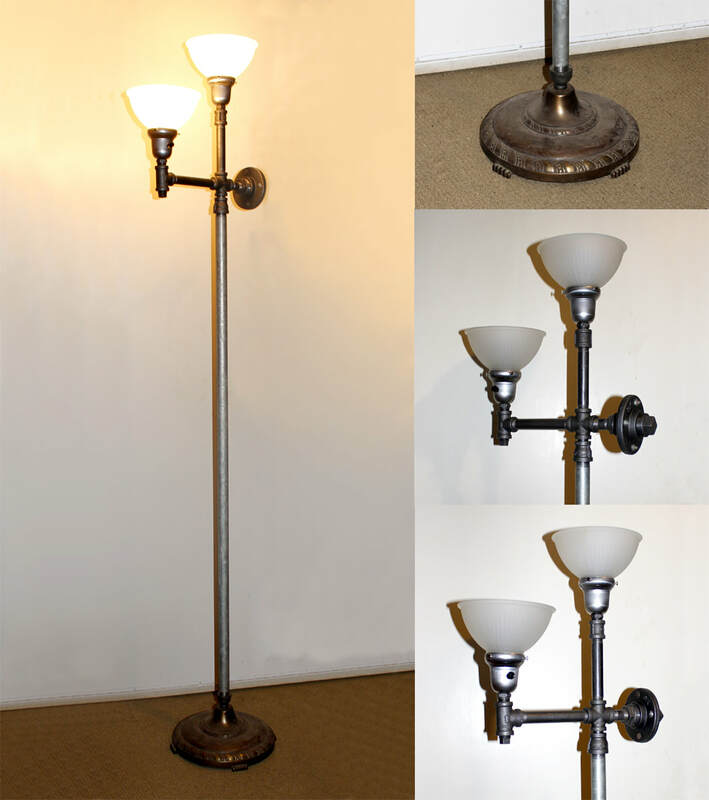 Lamp height is approximately 30 inches. 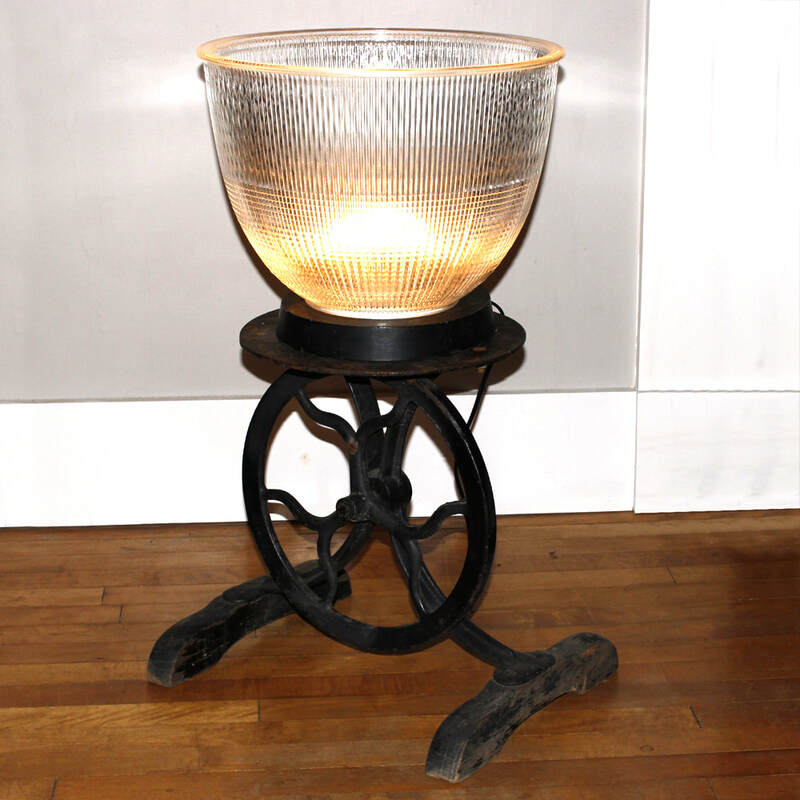 Includes 15” diameter x 8” tall shade. 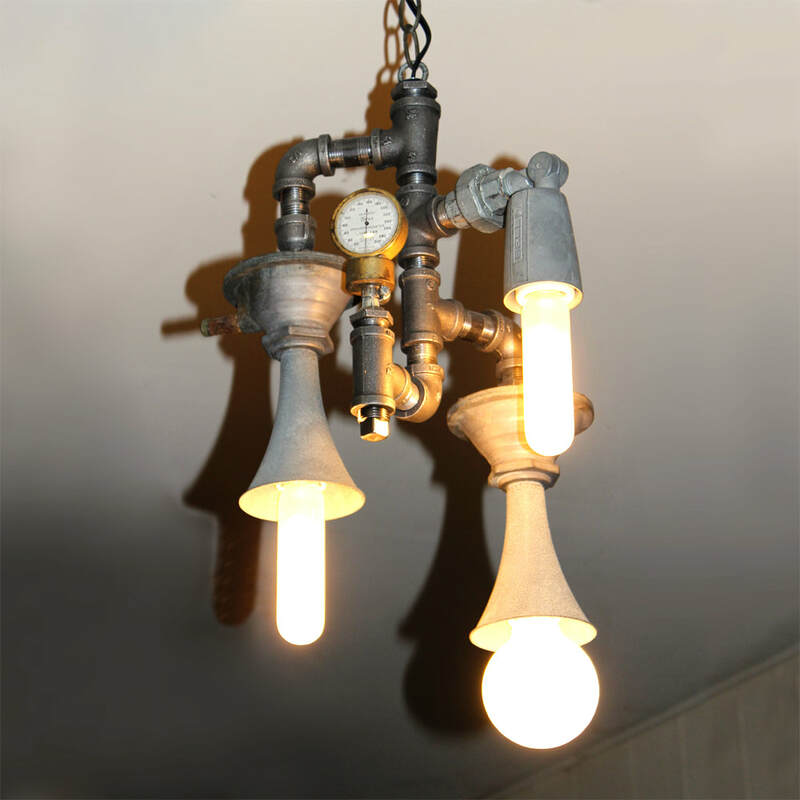 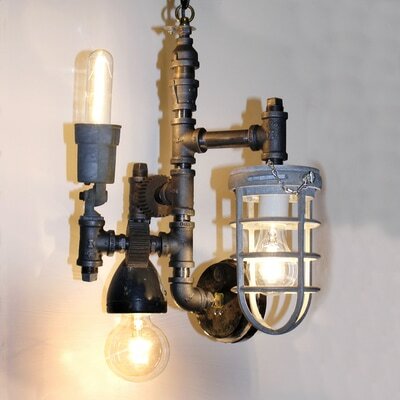 Pipe sconces capture an industrial look with a touch of steampunk flair. 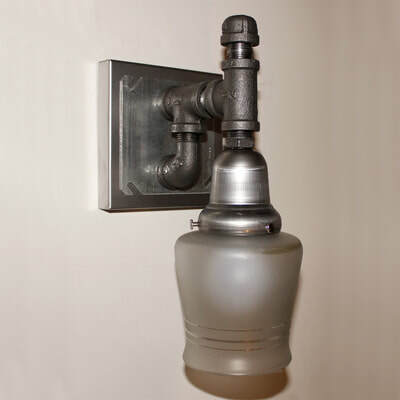 Easy electric box installation or choose surface mounting with cord, plug and switch. Shades may vary. Approximately 11 inches top to bottom. 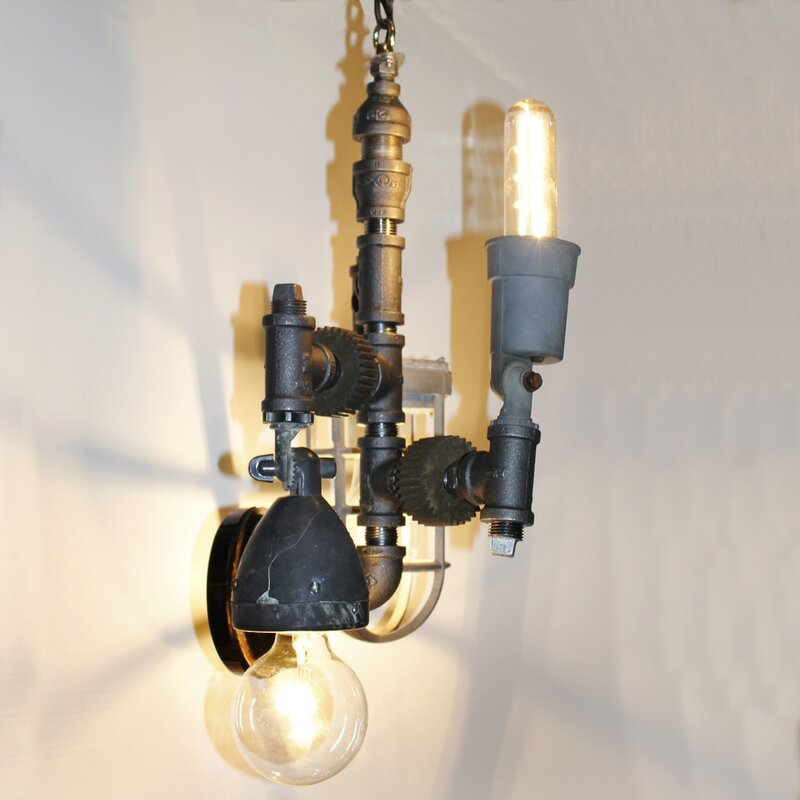 An industrial lamp created from an oversize glass shade and recycled vintage industrial machinery. The industrial/commercial shade is identified as Holophane Endural # 6631-A. 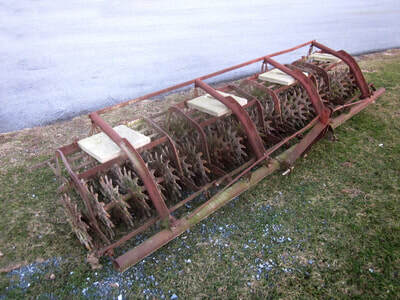 The base is some sort of vintage industrial machinery of unknown purpose, constructed of cast iron and wood cross feet. 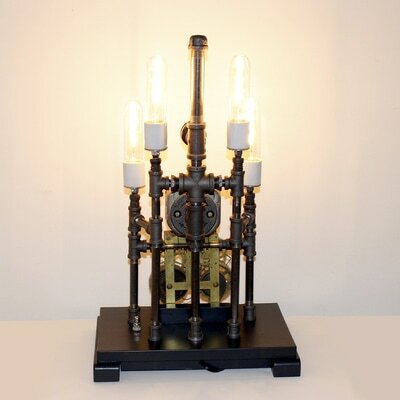 Features 8 candelabra sockets with 25 watt frosted 2” vanity bulbs, cord/plug and a 3-way switch lighting 3, 5 or all 8 bulbs. 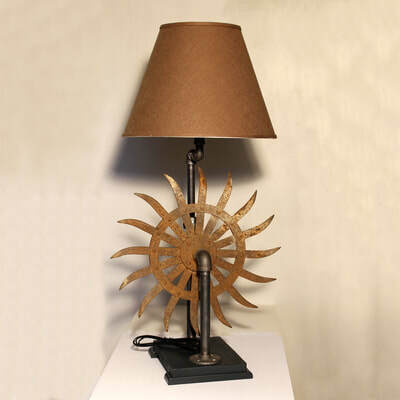 Height: 29 inches; shade: 15-1/2 diameter x 11 inches.